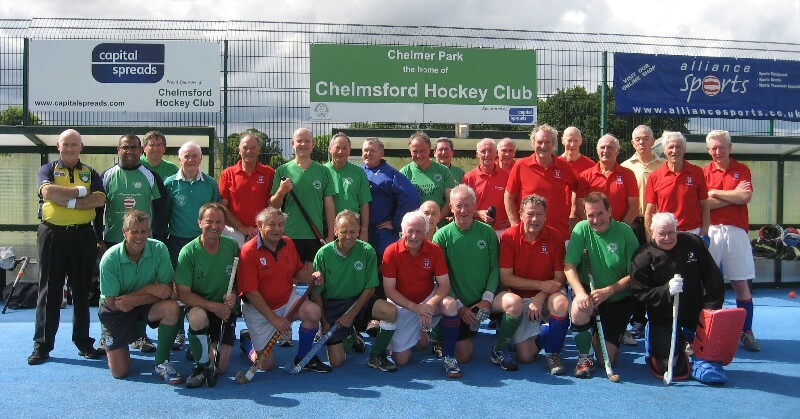 This game, played in memory of David Simms who passed away in October 2007 and was an enthusiastic member of both Clubs, was very well supported. David joined Chelmsford in 1994, previously playing for numerous Clubs, including Oxford and Cheam, and County hockey for Oxfordshire and Buckinghamshire. He joined the LX Club in 1999, and held important posts such as Membership Secretary, Press Officer, and especially Editor of the ‘LXer’ (in its previous format) for some seven years. The weather held firm, and Evergreens with a strong skilful team got off to an early start, with a goal from Mick Able just inside Alan Dures’s right post. LX were soon making progress towards the opposition’s goal with spirited runs down the wings by Brian Woolcott and David Wilkinson. However Evergreens, with a powerful midfield, spurred on by skilful Welsh GM player, Ralph Thomas, slotted home two more goals via Ed de Mello, before half time for a 3-0 lead. In the second half the LX defence played more as a cohesive unit, and Mick O’Malley, Gilbert Grace, David Young and especially guest Paul Berendt, who was a tower of strength at centre half, with George Hazell in top form, contained the Evergreens’s forwards. It was against the run of play when Ralph Thomas smashed home a goal from a penalty corner. This spurred on LX, and when the ball lodged under Chelmsford’s goalkeeper LXer Crawford McKee’s boot, the umpire let play continue, and Henrik Kjellin scored an opportunist goal for LX. Following this, both Adrian Stephenson and Martin Kavanagh went close, but the final score was a well deserved victory for the home team. The after-match hospitality was to the usual high standard, and organised by the other Evergreens goalkeeper (and Club Fixtures Secretary) Fred Matthews. David Simms’s son, Andrew, who played in the match, presented the Trophy to Chelmsford’s Captain Peter Hollebon, in the presence of June Simms and her daughter. Both umpires, Richard Bisley and Robert Nourse, were warmly thanked for their excellent performance by both Captains. LX Club team: Alan Dures, George Hazell, David G. Read (Captain), David Young, Paul Berendt (Guest), Gilbert Grace, Mick O’Malley, Brian Woolcott, Henrik Kjellin, Martin Kavanagh, Adrian Stephenson, David Wilkinson.